As you can see with my card I didn’t use the tWiSt, just the sketch but turned it around. This challenge will run over our Christmas break so will finish on Sunday 3rd January so if you have any crafting time over the festive period why not link up your creations? Challenge rules can be found HERE and remember if you take part and link up using one of our images you get a $1.00 voucher to use in the store 🙂 Also, don’t forget our Stamp of the Month challenge which will run until the 31st of December so you still have some time to link up using this super sweet image 🙂 All details for this challenge can be found HERE. For my card I also used Papermania Festive Spots and Stripes, red cardstock, green Core-dinations cardstock, Spellbinders Circle and Scalloped Circle Dies, WRMK Corner Chomper and Spectrum Noirs to colour. Wishing you all a Fabulous Christmas and Best Wishes for a Very Happy, Healthy and Peaceful New Year! This is adorable, Karen. I really like your take on this week’s sketch. Karen – you are ending on a very positive note! This is great – I love your take on this sketch – great embellishments!! I am so glad to have “met” you this year! Have a blessed Christmas and a Happy New Year – I’ll see you again in 2016! 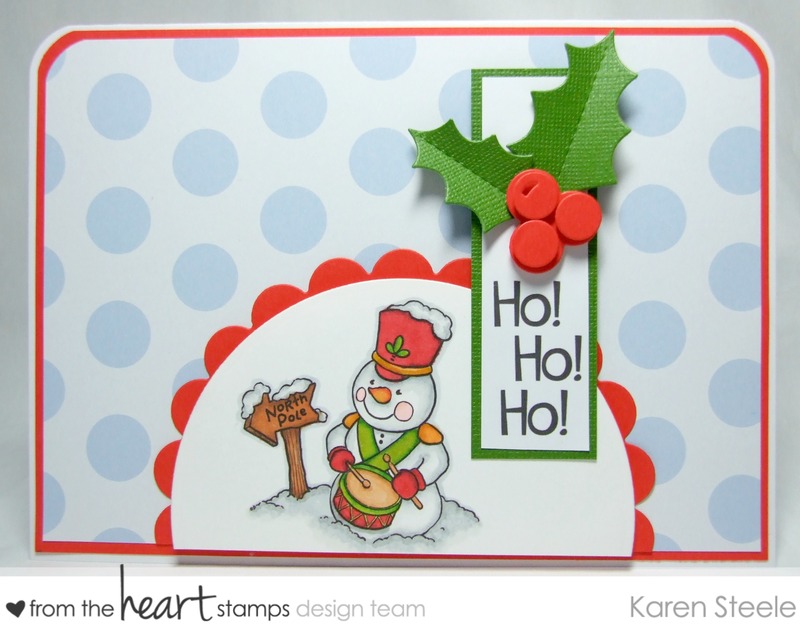 Awesome design and love the little drummer snowman! Merry Christmas and Happy New Year to you and family!